I’m a busy mom to very active twin 6-year-old girls. From the moment I wake up at 7 a.m. to get them ready for school till their bedtime at finally 8 p.m., it’s non-stop action for me. With balancing my career and life with twins I always have to make sure I have the proper nutrients to stay energized throughout the day. Mid-afternoon is when I feel sluggish and fatigued. This is the time when I’m tempted to have a big cup of coffee or sugary treat. Instead I turn to a green smoothie to rejuvenate me and keep me running circles at the park and concocting new recipes in the kitchen. With a variety of energy-boosting ingredients to add, I really don’t miss the caffeine or the sugar rush. 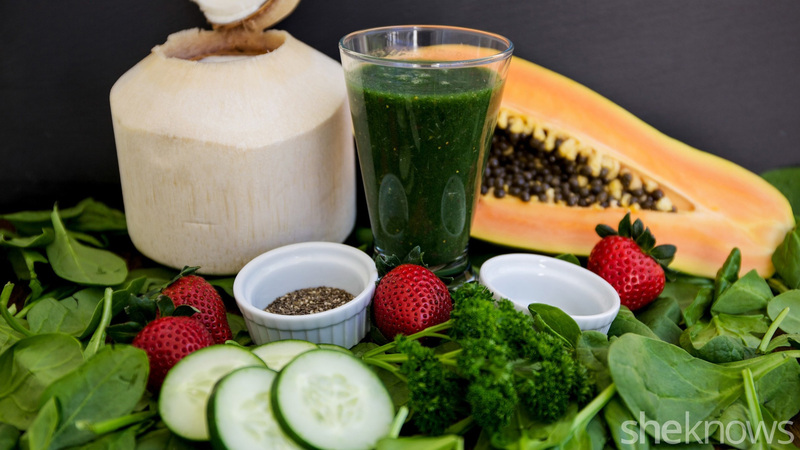 Try a green smoothie with one or more of the ingredients listed here to give you a boost and provide long-lasting energy throughout any hectic day. I like the base of my green smoothies to be a leafy green like spinach. It is a mild flavor and blends well with any combination of fruit, vegetables, nuts and seeds. You can add to fight fatigue and exhaustion. Add a few or add them all! Coconut water: There are many liquids to add to your smoothies besides just water. Coconut water is great because it’s still low in calories but contains natural electrolytes like sodium and potassium. The average person sweats about 1.5 gallons per day, so it’s important to replenish electrolytes to avoid fatigue. Most popular sports drinks contain electrolytes as well, but are high in processed sugars. Coconut meat: If you are going to use coconut water as your base, do not forget the coconut meat! The coconut water and the coconut meat are the perfect partnership in fighting fatigue. Coconut meat is a great source of potassium. It supports body growth and maintains normal heart, digestive and muscular system function. Even though potassium does not directly give you energy, when deficient you will experience weakness that will discourage you from physical activity. Parsley: Not only does parsley help flush out toxins from your body and support kidney function, but it is also high in iron. Iron deficiency is the most common nutritional deficiency in the U.S. because it’s one of the hardest minerals to absorb into the body. Iron helps produce hemoglobin, which helps deliver oxygen throughout the body. It is vital to include iron in your diet as much as possible to avoid extreme fatigue and shortness of breath along with numerous other ailments. Strawberries: I chose strawberries to pair with parsley because it contains more vitamin C than oranges. Vitamin C not only acts as an aid in iron absorption, but because it’s a water-soluble nutrient it also helps convert the food we eat into energy. Our bodies use vitamin C to make L-carnitine, which helps you burn fat for energy. Chia seeds: One of the world’s super foods, chia seeds are high in calcium, phosphorus, magnesium and manganese. They help prevent hypertension and are important for energy metabolism. They are also known as “Aztec running food.” They used chia seeds to boost their energy and increase their stamina. Papaya: This fruit adds a creamy texture to smoothies and is also high in fiber, therefore keeping you fuller longer, and it helps maintain blood sugar levels. 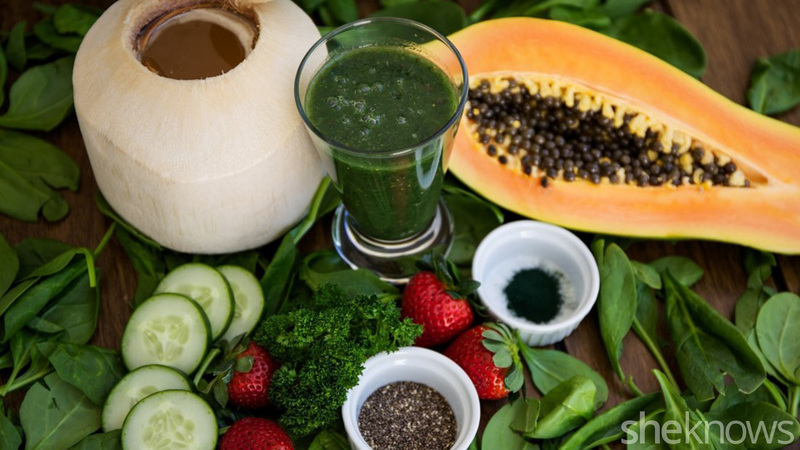 By adding more fiber to your smoothies you can avoid the blood sugar spikes and crashes. Cucumber: Most people do not know that cucumbers are considered clean energy. Cucumbers contain a carbohydrate that is not encumbered by fat, cholesterol or sodium. It’s the solar power of vegetables. Spirulina: This blue-green microalgae is one of the richest and most-complete food sources in the world with over 100 types of nutrients, and it consists of 60 percent protein. It’s the equivalent of nature’s energy drink. These 100-plus nutrients not only aid in physical energy levels, but mental boost as well. Lack of sleep and fatigue can also show on your face, resulting in a tired and dull complexion. Make sure to try Garnier’s Ultra-Lift® Miracle Sleeping Cream to regenerate your cells and leave you with firm and well rested looking skin all day long. Swap out what you don’t like or add more with the list I provided for you.